Hyde Park Remembers President Franklin D. Roosevelt At Christmas! 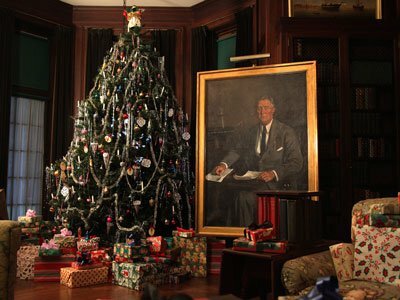 Hyde Park, the Hudson Valley home and final resting place of President Franklin D. Roosevelt, will hold a festive holiday Open House with music and refreshments on Saturday December 15 from 11-4 p.m.
Roosevelt’s Hyde Park home is one of the most famous residences in the country and one of the most beautiful homes in New York. The mansion will be a dazzling display of Christmas decorations from down through the ages. This is a popular event and parking is limited so it is advised that you carpool to this event. Refreshments will be served. This entry was posted in Dutchess County and tagged frankline d. roosevelt. Bookmark the permalink.